In the latest edition of Famitsu, Sega revealed various details about its upcoming Yakuza spin-off Judge Eyes. 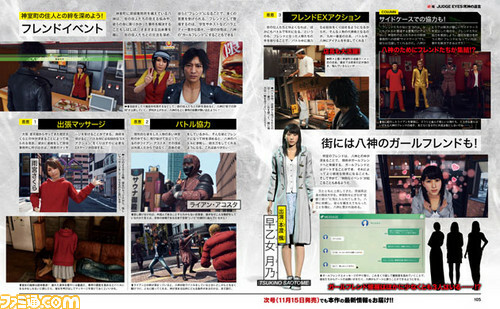 The primary focus of the new details are on the various NPCs that players can interact with in the district of Kamurocho. Protagonist and private investigator Takayuki Yagami will be able to interact with various residents and building his relationships with them will grant various benefits and potential new cases. For example, Sakura Amamiya will offer on-duty massages, while Ryan Acosta Ninja will aid Yamagi in combat and the manager of Kyushu No.1 Star will provide items for use in battle. Yamagi can also enter romantic relationships with certain characters and can ask them out or be asked to go on dates. There are at least three characters who can become Yagami’s girlfriend, including college student Tsukino Saotome. Set in the same world as the Yakuza series and developed by the same Ryu ga Gotoku Studio, Judge Eyes is a legal thriller that follows Takayuki Yagami — played by actor Takuya Kimura — a former defence lawyer who works as private investigator after the betrayal of a former client. The game is set to be released in Japan for PlayStation 4 on December 13, 2018, and is planned for release in North America and Europe in 2019, where it has the working title of Project Judge.